On Tuesday Pakistan became the only team to feature in the semi finals of all four World Twenty20 tournaments that have taken place thus far. Pakistan were also the only team to have featured in the semi final line up of the three previous World T20 tournaments. And they remain the only team to have played two World T20 Finals; however they could be joined by Australia or Sri Lanka if either of them qualify for the finals. On Thursday, when Pakistan take on Sri Lanka in the 1st Semi Final of the World T20 2012, it will be the 4th consecutive World T20 semi final that Shahid Afridi and Kamran Akmal will play. 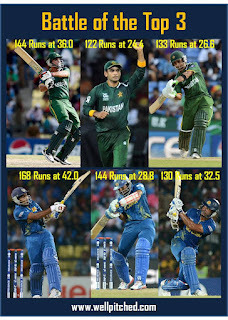 While it will be the 3rd World T20 semi final for Mohammad Hafeez, Shoaib Malik, Abdul Razzaq, Saeed Ajmal, and Umar Gul. That is one experienced line up. If it were not for a Michael Hussey juggernaut in 2010, Pakistan would have played a 3rd straight World T20 final, but it was an unbelievable and an unfortunate day in St. Lucia for the Pakistanis as Hussey produced a whirlwind and shattered Pakistan's hopes. This time, the Greens are up against Sri Lanka, who started this World T20 as one of the favorites. Playing the Sri Lankans on their home ground is never easy, but I believe Pakistan has it in them to go all the way. Historically, Pakistan has done well against the Sri Lankans, winning 6 out of the 9 T20 internationals that the teams have played against each other. Out of the three matches they have played in World T20 tournaments, Pakistan have won 2 (including the final of the World T20 2009) and Sri Lanka 1. Both, Pakistan and Sri Lanka have looked very strong during this World T20, however I feel that Pakistan has been the more dominant team out of the two. Pakistan completely outplayed New Zealand and Bangladesh during the Group stages, and dominated Australia in their last Super 8 game. They stuttered against South Africa, but came back strongly to win that game narrowly. They have had only 1 bad game in the entire tournament and that was against India where they looked meek and out of sorts. Sri Lanka, on the other hand, remained unbeaten in the Super 8 stage beating England, West Indies, and New Zealand on their way to the semi finals. While they dominated the West Indies and England, they tied against New Zealand and won in the super over. They annihilated Zimbabwe in the opening match of the World T20 and only lost a shortened 7-over sprint to South Africa in the group stages. Besides the historical advantage that Pakistan holds, there is very little to choose between the two teams as far as this tournament is concerned. As far as the batting is concerned, Pakistan's top 3 of Mohammad Hafeez, Imran Nazir, and Nasir Jamshed are their leading run scorers in this tournament. The top order has traditionally been a worry for Pakistan, but in this tournament it is their top 3 who have done the bulk of the scoring. 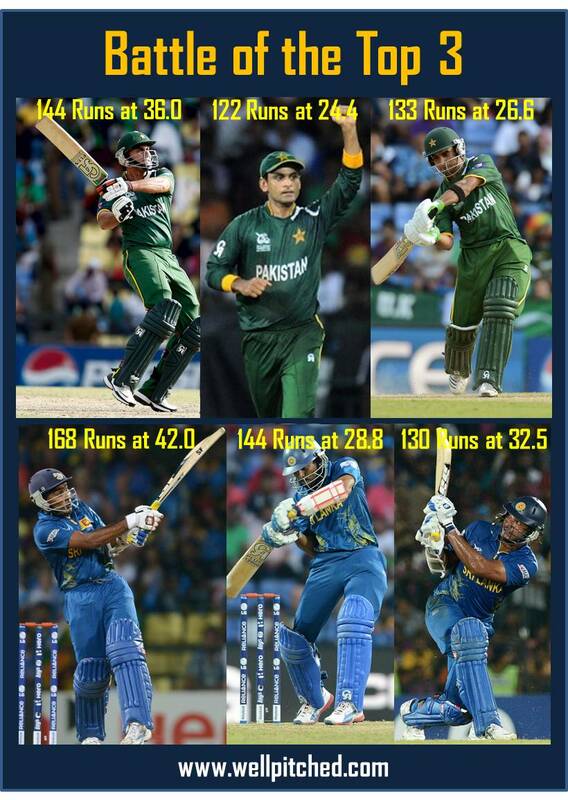 Even the middle order comprising of the Akmal brothers, Shoaib Malik, and now Abdul Razzaq looks solid. Razzaq showed some touch during Pakistan's last Super 8 game against Australia, and if he can fire with the bat in the closing overs, it will provide Pakistan with the much needed fire power lower down, which has been missing due to Afridi's bad form with the bat. For Sri Lanka as well, it is their top 3 of Jayawardene, Dilshan, & Sangakkara who are their leading run scorers in this World T20. Even though their middle order remains largely untested, the likes of Matthews, Thirimanne, Mendis, and the hard hitting Perera can be very dangerous on their day. Sri Lanka has two match winning bowlers in their ranks in Lasith Malinga and Ajantha Mendis, both of whom are among the leading wicket takers in this World T20. Mendis had a rare off day in the last Super 8 game against England and Pakistan has traditionally played him well, but he still poses a threat, while Malinga is the sort of bowler who can turn a match on its head within an over. For Pakistan, Saeed Ajmal is the key, who is also among the leading wicket takers in this tournament. Even though they possess another two top quality match winning bowlers in Afridi and Umar Gul, both of them have been off color in this World T20. While Afridi has still managed to remain relatively economical, Gul has gone for over 10 runs an over. Gul did seem to come back to some sort of rhythm in Pakistan's last game against Australia, but he is still far away from being the dangerous death bowler he once was in T20s. The rise of Raza Hasan though is a positive sign for Pakistan. The 20 year old did what no other bowler has managed to do in this entire tournament - he tamed the man beast Shane Watson and finally ended his run scoring spree. What has been remarkable about Raza is that he has opened the bowling for Pakistan in all their three Super 8 games against the batting power houses of Australia, South Africa, and India, and has managed an economy rate of only 4.36 in 11 overs, which is the best economy in this World T20 for any one who has bowled more than 5 overs. Even though Sri Lanka have the home advantage, Pakistan were based in Colombo for their Super 8 games and are well accustomed to the conditions. There is no doubt that both teams are going to attack with spin, and it will possibly come down to which team plays the other's spin better. It is going to be a cracker of a match. Even though I am stopping short of calling out a sure shot winner, I do believe that the winner of this semi final will lift the trophy on Sunday.